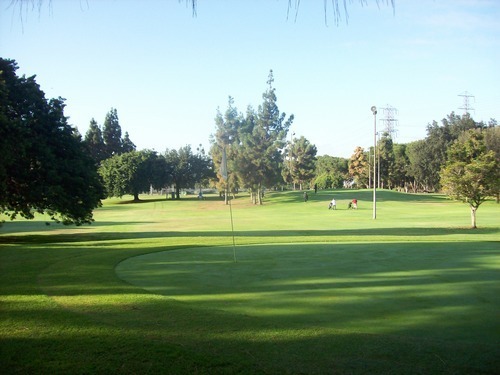 Well, I guess you can call this my official declaration that I am going to try and play all the public “short” courses in Southern California. Since private course opportunities are proving to be few and far between at the moment, I’m going to play more of the public par-3s, executives and 9-hole courses when I can. It’s not glamorous, but the “completist” in me feels compelled to play everything I can. You may have noticed I’ve been sprinkling a few in here and there lately anyway, but every so often I am going to have what I’m calling a “Short Course Blitz” day, where I knock out a bunch at a time. Don’t worry as each review will also be kept rather brief, too. Today was my first blitz day and it was definitely productive with six, count ’em six, little courses played. When I was working toward my public regulation course goal in recent years, one mistake I may have made in some regions was playing the better courses first and leaving some of the weaker options for last. I took the opposite approach today by diving head-first into the shallow end of SoCal’s short course pool. I stayed in the eastern part of LA County. 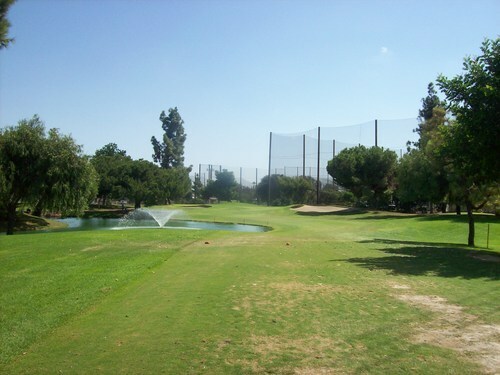 I booked a 6:18 tee time through GolfNow. The weekend rate here is $19 for nine holes, which is a bit steep if you ask me. It was still too dark when my tee time rolled around, so the starter had me wait. He was a very nice guy and told me about all the major renovations they did to this course last year. Better irrigation, some slight design adjustments and nicer conditions all the way around. By all accounts, everything they did was a vast improvement. I don’t have a frame of reference having not played here in the past, but I thought the course was in pretty good overall shape. The greens were definitely quite good and the rest of the course was fairly lush and green. This will never be a perfectly manicured show-stopper, but it’s much better than I expected. 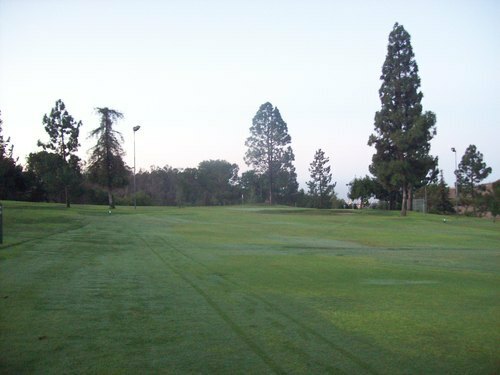 I played with two other singles and we teed off around 6:30, finishing all nine holes in about an hour. Speaking of tees, they do force you to hit from mats here, which is unfortunate. They do not have rubber tees set up in the mats, but the mats supposedly allow you to put in a regular tee. 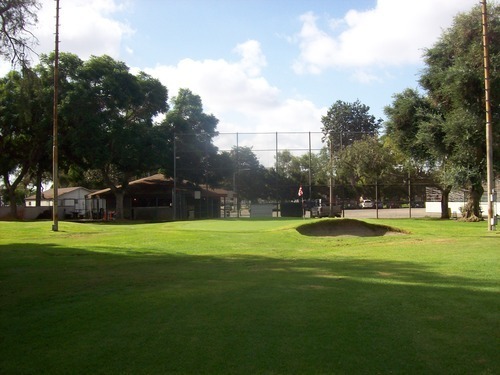 In actuality, it only just barely goes in the surface, so I used a standard short tee to hit my driver on the two par-4 holes (1 and 9) and then just hit off the deck for the rest of the holes. Fortunately, right now the mats are in great shape and nice to hit from, so hopefully they replace them regularly as time goes on. 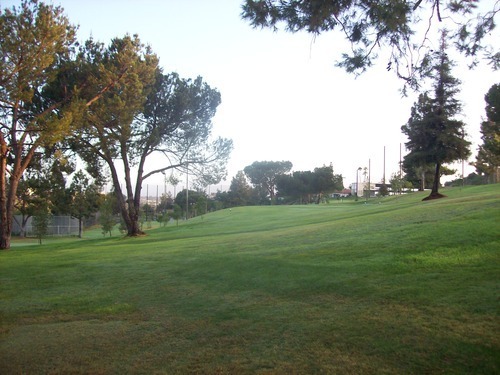 The course itself is pretty basic with a few hilly parts that add a little fun. 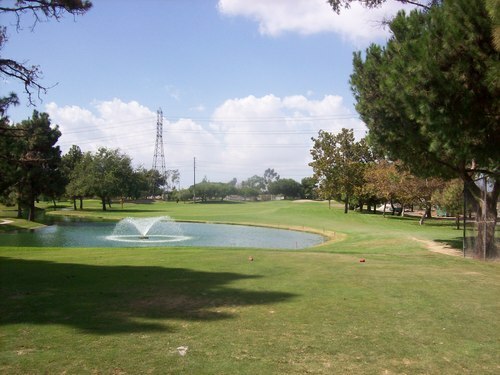 It plays to a par of 29 with two short par-4s and a mix of par-3s ranging from 121-148. 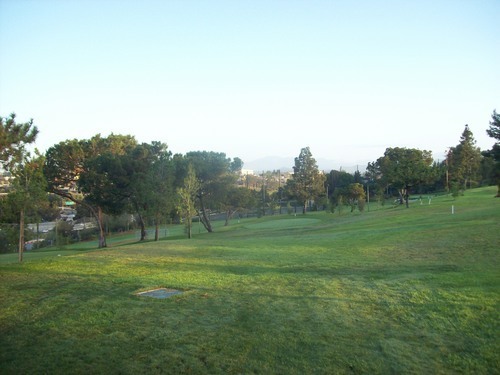 The 3rd hole is probably the most entertaining with a significant drop from tee to green. 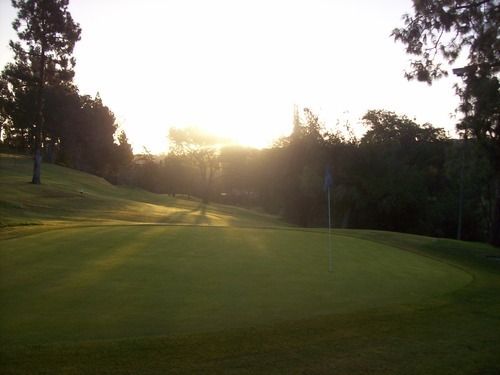 The greens here are on the small side and do feature some sloping and undulation. The most notable green is the 6th, which has a few small tiers and is pretty tricky. There aren’t a ton of bunkers on the course, but the ones they have look good with interesting contours. I assume reshaping the bunkers was something they worked on in the renovation. 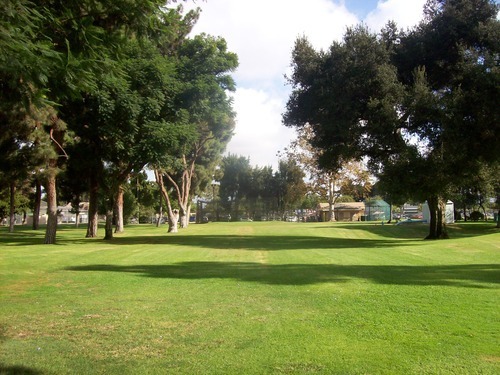 Overall, Monterey Park is a solid little executive track. Nothing too exciting, but interesting enough and it gets the job done for a quick and fun nine. 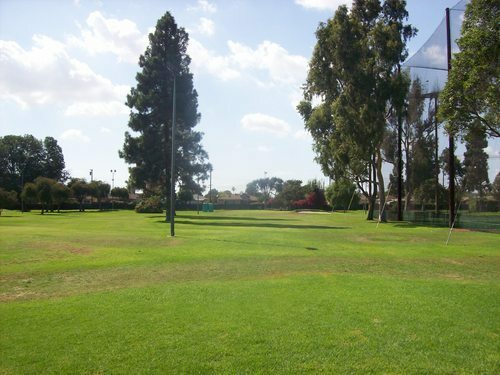 They do have a huge and modern driving range with the automatic ball-tee-er-uppers. Fancy. 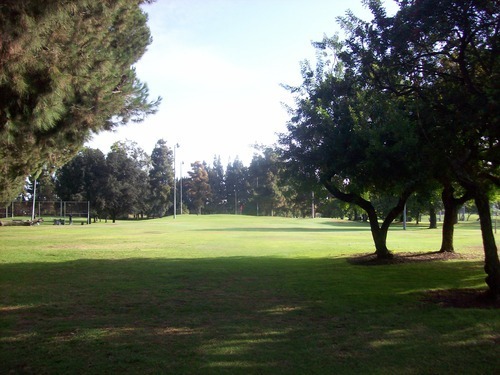 This pitch and putt is located in Ford Park and is sometimes referred to as Ford Park Golf Course. 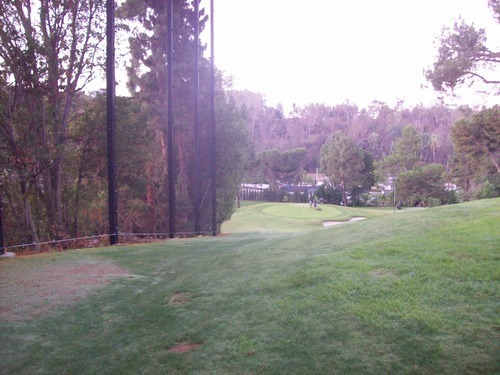 It is also only nine holes, but is all par-3s ranging from 83 yards up to 124. The price was $10. I did get stuck in the middle of some groups, but it was still a pretty quick and easy round. Bell Gardens also uses mat tees, but most of them here were pretty beat up. These ones did have the low rubber tees in place, though, so I didn’t have to hit off the deck—and didn’t want to on these ratty suckers. 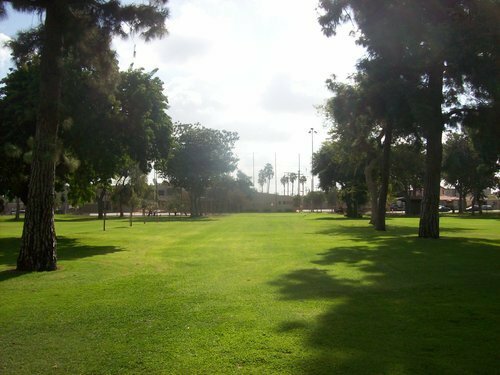 The greens here are tiny circles and they all slant significantly from one side to the other, so their sizes and slopes are definitely the biggest elements of defense. Otherwise, it is a very straightforward course where most folks won’t need more than a wedge and a putter. 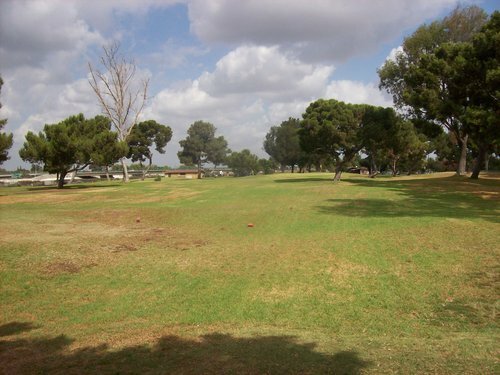 Other than the mats, the course was in reasonable shape. The greens were soft and smooth enough for putting, and that’s what matters most on a short course like this. There isn’t too much else to say about Bell Gardens. It’s there and it doesn’t pretend to be anything more than what it is, so I got no beef with it. 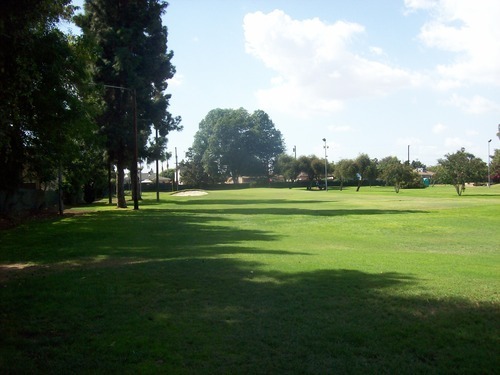 As I’ve said before, my own roots are on a pretty crappy little course that was barely more than a “pitch and putt,” so I understand the appeal of a place like this for local kids, seniors and beginners. 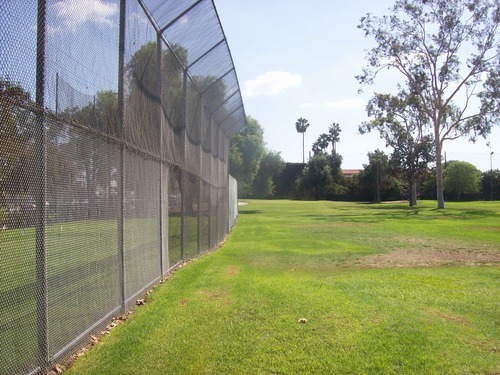 I’d say in terms of conditions, South Gate was a slight step down from Bell Gardens. Not horrible, but solid enough for what it is. 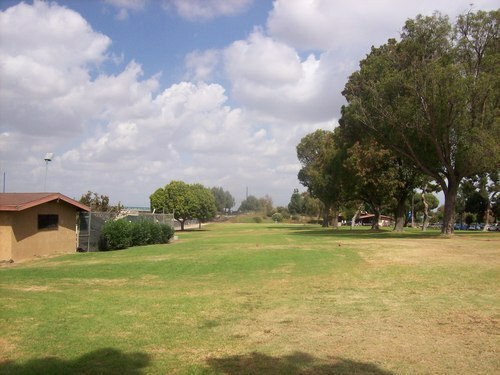 It is also part of a busy city park complex. The price was just $6.50 for nine holes, so it’s definitely worth that. 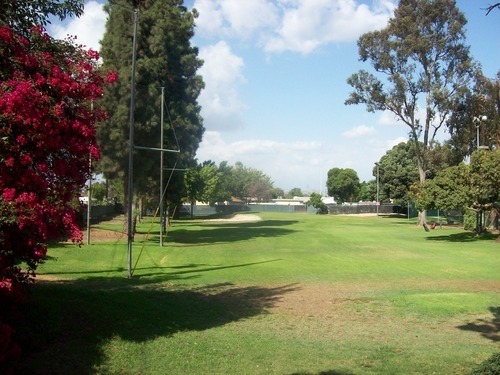 South Gate is also all par-3s, with holes ranging from 82 yards up to 156, so it presents a little more diversity and challenge than Bell Gardens. 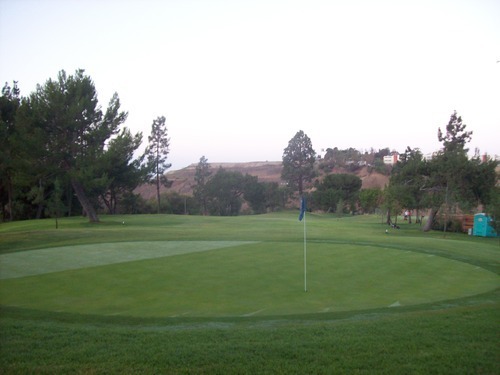 The greens here are also small, but don’t feature much slope, so putting is easier. 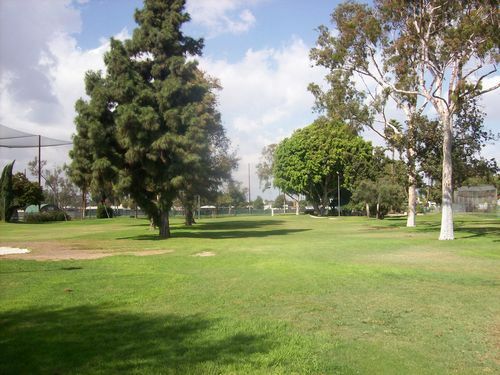 Though geared toward the beginning or very casual golfer, South Gate is a more frustrating design. 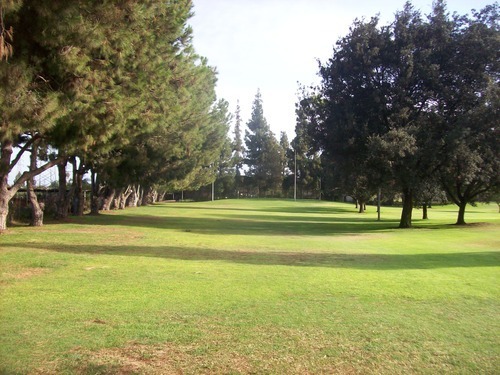 The holes are lined by trees and they really come into play, hanging over a lot and making for some uncomfortable and difficult angles to the greens. 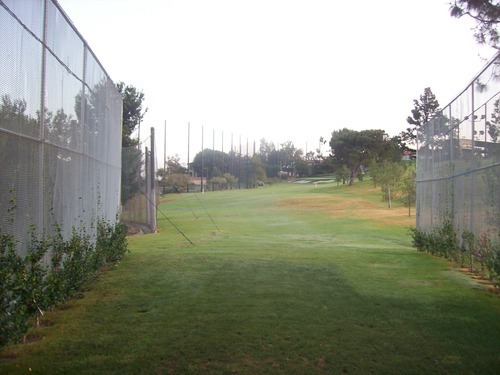 For the customers they attract, they would be smart to cut back some of the overhanging trees on a few of the holes. It would make for a better experience for everyone. That’s about all there is to South Gate. It exists, I suppose. 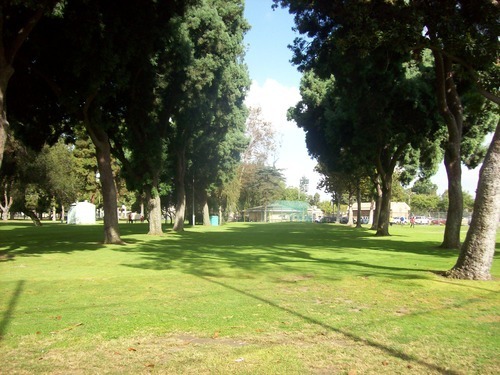 Of course, thanks to the 1990s rap music and films, Compton makes you think of some bad things. 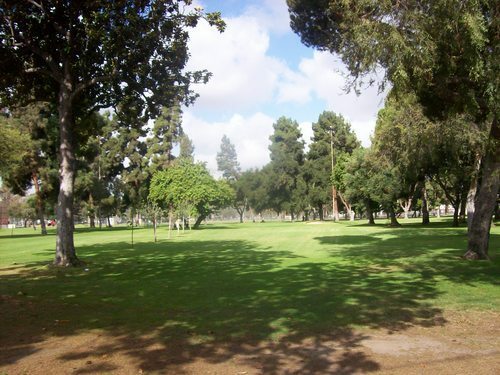 But in fact, Compton’s little golf course is a pretty friendly place. The price was just $6. It wasn’t super crowded, but it was busy out and the pace was pretty slow with some really bad golfers out there. It’s very laid-back and nobody seems too concerned with pace of play, so I just relaxed and enjoyed it as much as I could.. I was joined after a few holes by another single and that helped make my round more tolerable being behind the big groups. 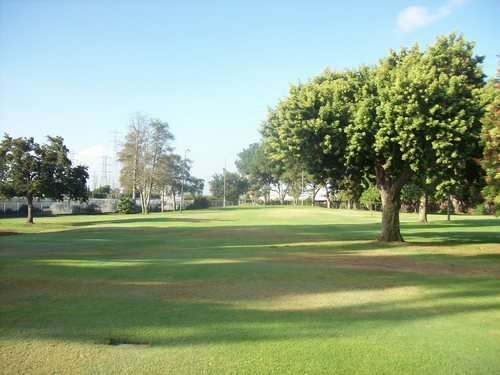 As for the course itself, it’s a $6 par-3 course in Compton. That about says it all. 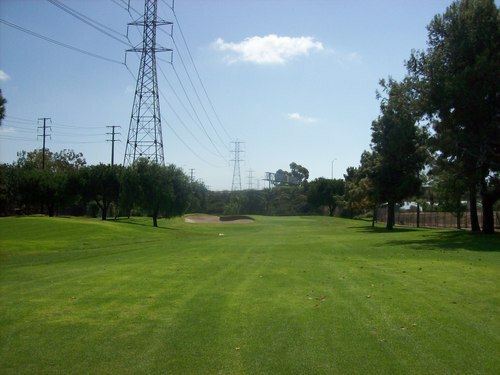 It was probably in the worst shape of everything I played today, but it was far from terrible. One positive thing to note is that they don’t use mats here like almost everywhere else I visited today. Sadly, I was actually missing the mats a little as some of the tee boxes were quite chewed up and unlevel. 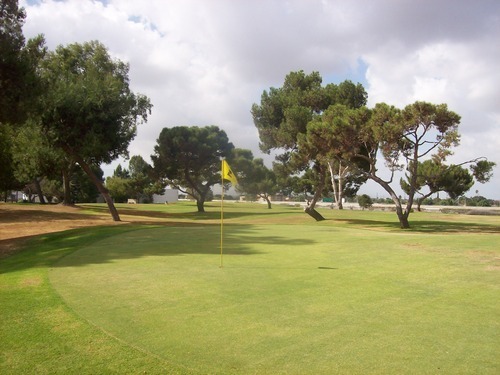 The greens here are medium-sized and feature some interesting slopes and undulation to add some challenge. 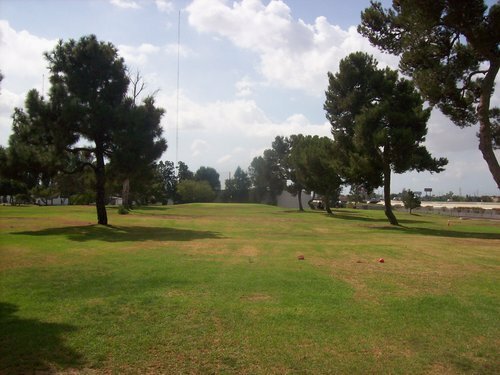 Compton is certainly NOT what I’d consider a “pitch and putt” course. It’s all par-3s, but they play in the mid-length range from 125 yards up to a couple that are 160. So, yes Virginia. 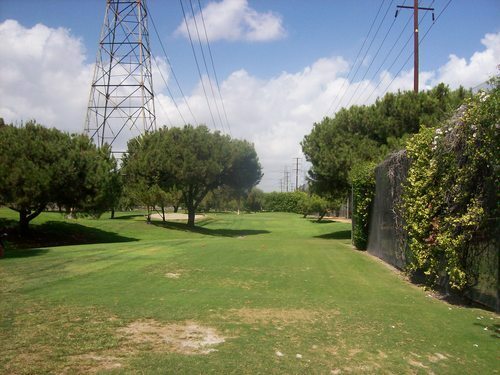 There is a golf course in Compton. It’s cheap and it’s as much fun as you want to make it. 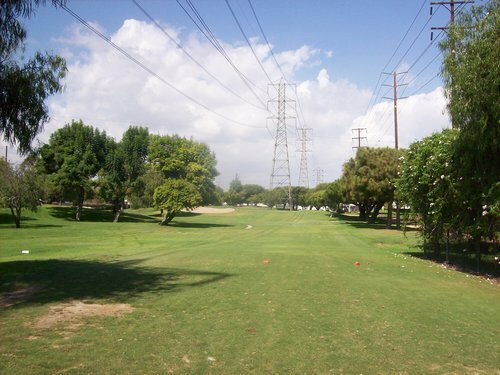 This course is shoehorned in between the San Gabriel River and the 605 and 91 freeways. Given its location, you wouldn’t expect much of a golf course to be there. However, Iron-Wood was easily the biggest surprise of the day for me. This is a pretty cool little track. Iron-Wood reminded me of a short version of Rio Hondo. 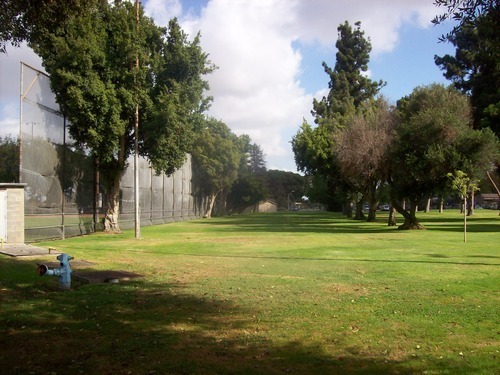 Like Monterey Park, it plays to a par of 29 with two short par-4 holes (2 and 4) and par-3s ranging from 111 yards up to 151. 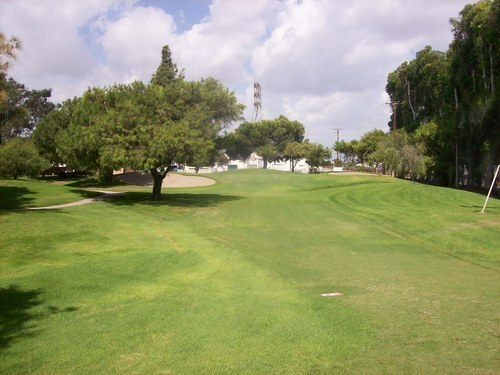 Other than some ugly burnt-out spots on a few of the fringes, the course was in very good overall shape. There is some nice contour to this design that makes it much more visually interesting than everywhere else I played today. It’s a pretty good-looking course, in fact. The greens here feature some very unusual shapes and sizes and for whatever reason, all the pins were in the back today. That added some challenge for me since I wasn’t familiar with the greens at all. 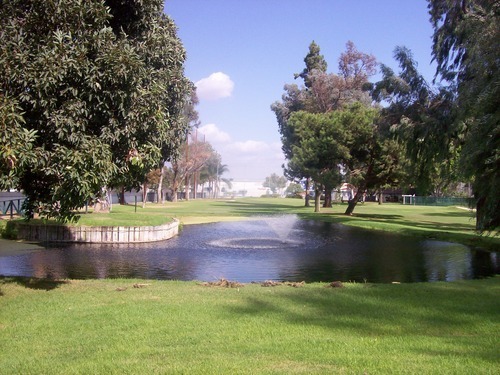 There are a couple of nice water hazards on the course (holes 2, 8 and 9) for added visual appeal and intimidation. Holes 8 and 9 are really the signature holes here and a great way to finish a fun round. The bizarre 8th green is something you have to see in person to believe. I would say this is one of the nicer nine-hole executive courses I’ve played around here. It isn’t anything super amazing that you all must go and play it, but it definitely was an unexpected treat for me. The price was $14, so it’s definitely a little more than the other short courses around, but it’s worth shelling out a few more bucks to play here over the last three courses I reviewed (and the next one, too). 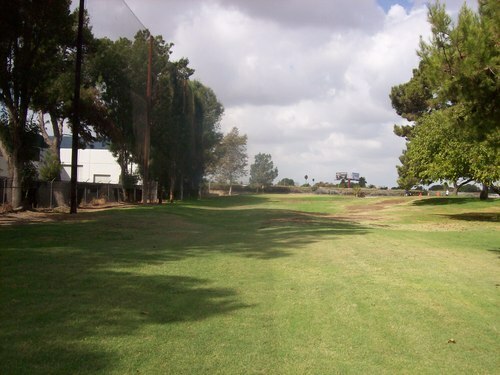 Note: This course has since been renovated and reopened as Don Knabe Golf Center & Junior Academy. Read my review of the updated course here. I wasn’t sure if I had enough energy, but I got to the course and could see it wasn’t very crowded. So I went for it. $7 was the price and that was fine with me. I did catch up to a few groups and the pace slowed down a lot, but I powered through and survived. 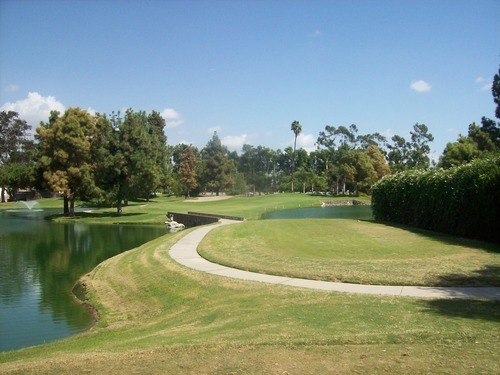 Though I played six different courses, I only played 54 holes and all but four of them were of the par-3 variety. Still, that was a lot of walking and carrying my bag. I did take out unnecessary clubs at each location, so that helped make the bag lighter. 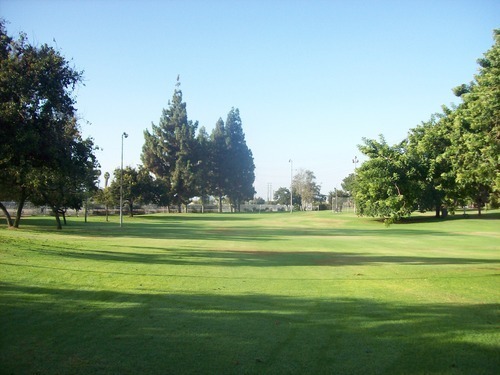 Anyway, Norwalk is a very basic par-3 course, ranging from 91 yards up to 140. There isn’t anything particularly interesting about the layout. What you see is what you get. Good shots are rewarded. Bad shots will make you work a little bit to save par. There isn’t much trouble to get into, so it’s a good course for beginners. That’s definitely the target audience here and it serves that purpose just fine. I will say the 1st hole here today was one of the most intimidating 98-yard shots I’ve ever encountered. They had the mat (yes, mats) right up against a fence with a top part that stuck out some, so it was like hitting along the razor’s edge if you wanted to go at the pin. 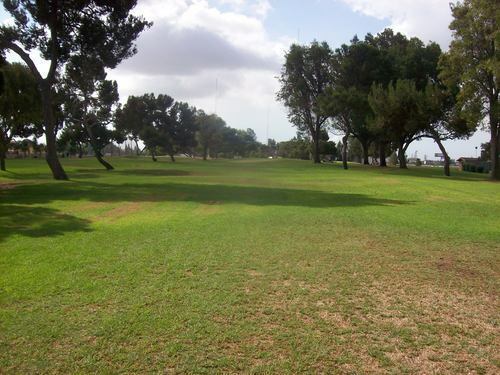 The course was in pretty mediocre shape with spongy, slow greens and mostly dried out elsewhere from tee to green. The mats were in varying degrees of disrepair, but all had the rubber tees so you don’t have to hit off the deck if you don’t want to. That’s all I have to say about Norwalk Golf Center. I’m too tired to write any more! Yeah, that’s the view from the middle of the 1st tee mat above. Yikes!